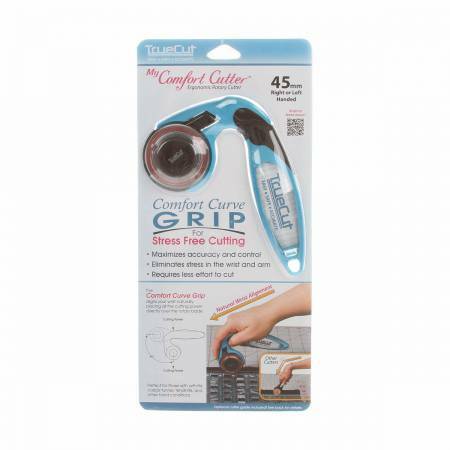 Ergonomic rotary cutter with a unique handle design that aligns your wrist naturally, placing all cutting power directly over the blade and eliminating stress in the wrist and arm. Works with the TrueCut ruler guide to keep all of your cuts straight every time or remove the cutter guide for normal use with any ruler. Can be adjusted for left and right hand use. Easy to use safety guard. Customizable handle inserts.